This was, by far, the word most often used by readers in yesterday’s survey to describe what they are currently struggling with. Very timely, given I already had this post planned. You will hear me talk about storage solutions a lot in the upcoming months (along with many of the other topics mentioned in the survey), as it’s something that I, too, am always working on. I tend to be exceptionally organized, but sometimes this means devising creative solutions for storing things that don’t have an obvious home. 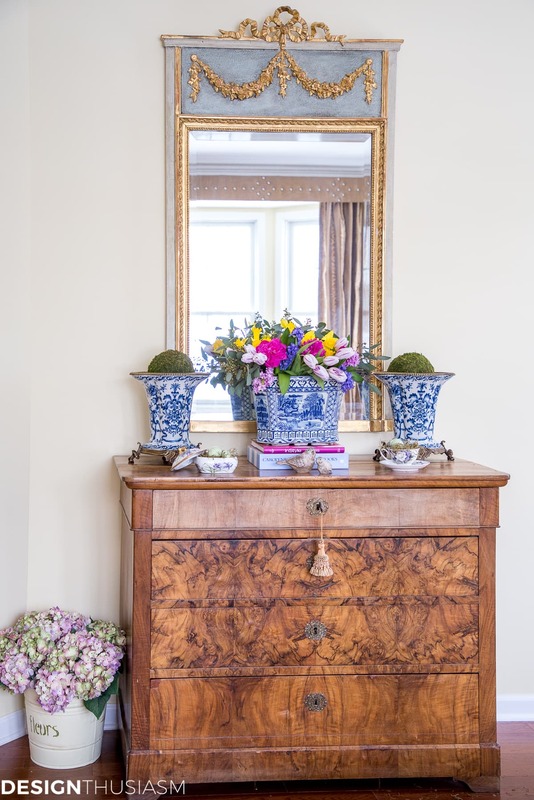 I am a staunch believer that the key to organization is ensuring that everything has a place (preferably close to where it will be used), and that you have the right containers to accommodate the things you need to store. But what happens when you’ve outgrown the obvious storage spots yet aren’t ready to discard the spill-over? Today we’ll look at storage solutions and 8 surprising places that I store things, in an attempt to tame the chaos. These aren’t outlandish or impractical storage solutions but just simple creative ways to eek out a little extra storage from the home you already live in. *This post was sponsored by Extra Space Storage but all opinions and ideas are strictly my own. 1. 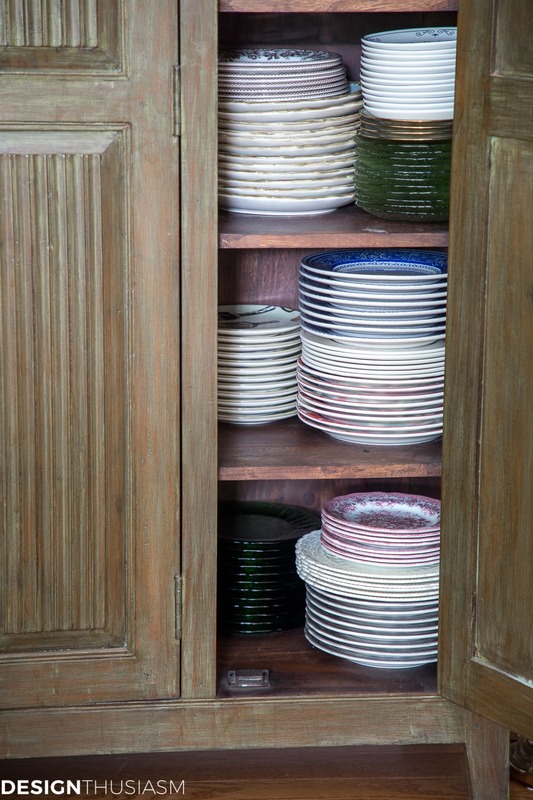 Store plates and chargers in a linen press – I am often asked where I store all the plates that I use in my tablescapes. As someone who firmly believes you need to constantly purge to stay organized, I have to admit when it comes to dishes I’m not willing to get rid of very many. I do too many table settings and purging only works for things you don’t actually use. So when you’ve maxed out the space in your cabinets, you need to begin to look at furniture to house some of the overflow. I could do a whole post on plate storage alone! 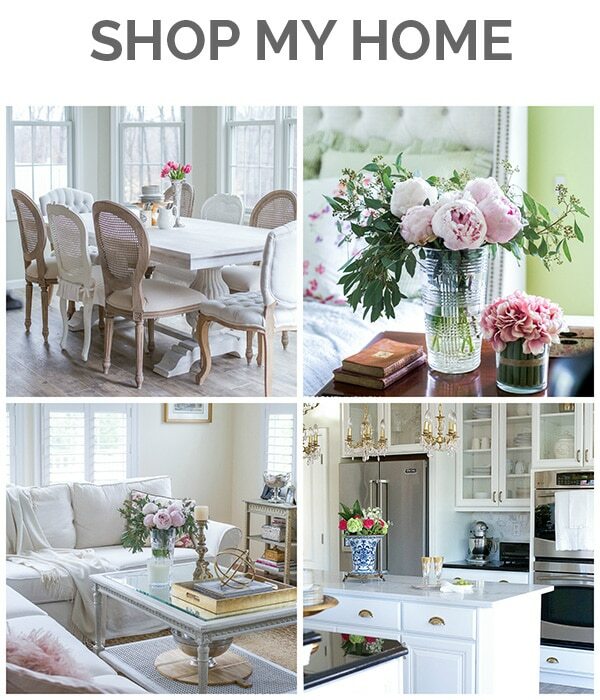 I use kitchen cabinets, butler’s pantry cabinets and a large classic china cabinet. But when those proved to be not enough, I co-opted the linen press above, to provide a bit more storage. 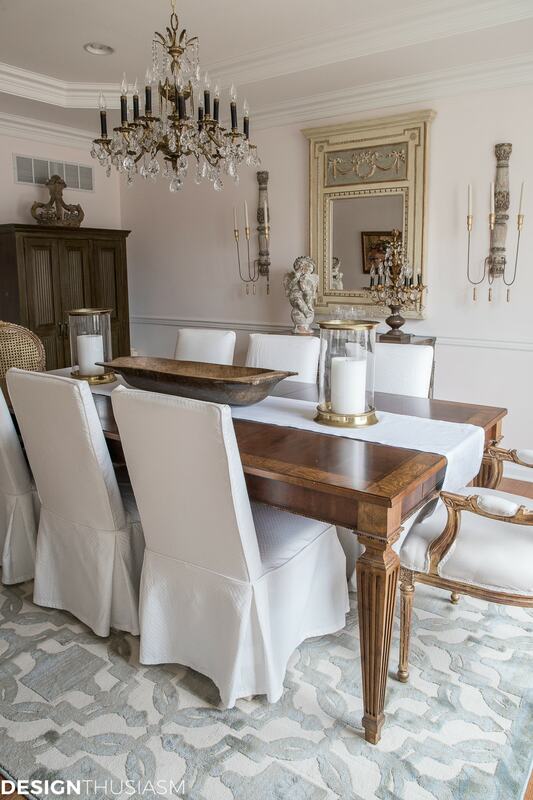 I keep it in my dining room and the closed doors allow me to layer various sizes and colors together. 2. 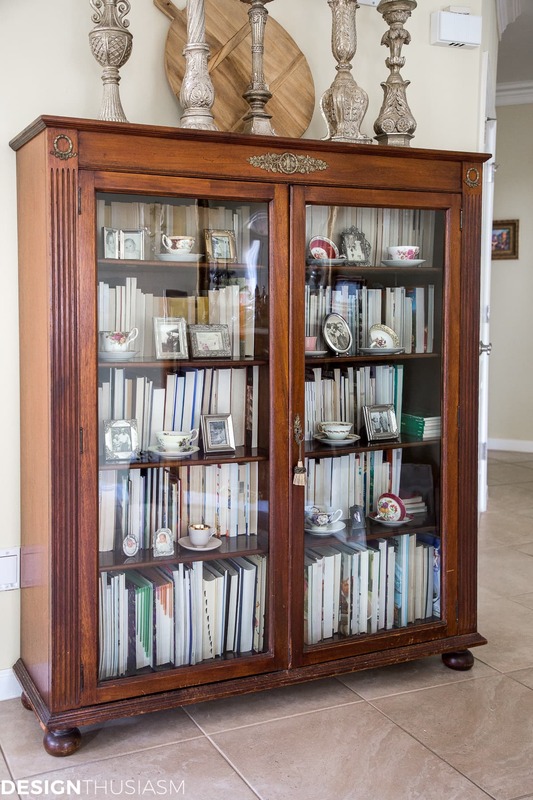 Store teacups in a bookcase in front of the books – I talked about this one a bit in my post about our entry foyer. I’ve collected teacups for a long time but in my effort to declutter, I prefer not to have them scattered about the house. 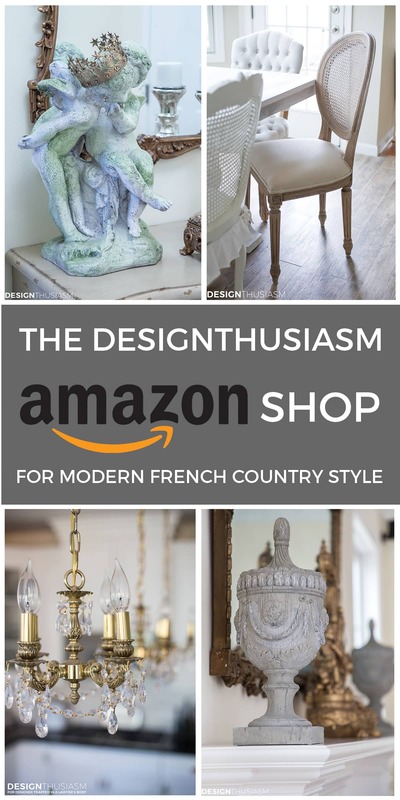 I think a collection has more impact when presented all together and I was stumped how to best do that when it came to my teacups. At the same time, I’ve been looking for a way to make this lovely antique bookcase look as pretty as it should. If the books were vintage they would look wonderful, but this is where I keep our everyday books. Still, I realized we hardly ever access them anymore because so much reading is done digitally. 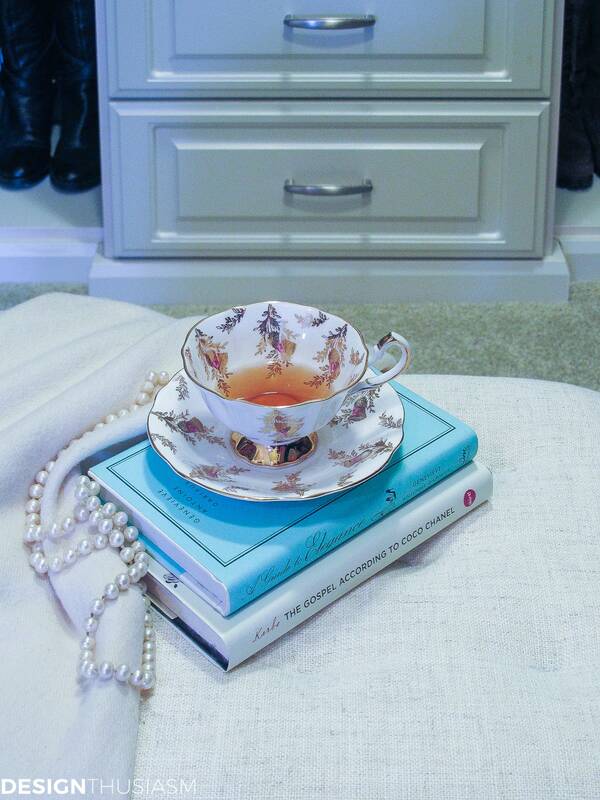 So one of my temporary storage solutions was to turn the books around and style charming teacups in front of them. The white pages offer a more cohesive backdrop than the various brightly colored bindings would, so you can instead appreciate the teacups. 3. 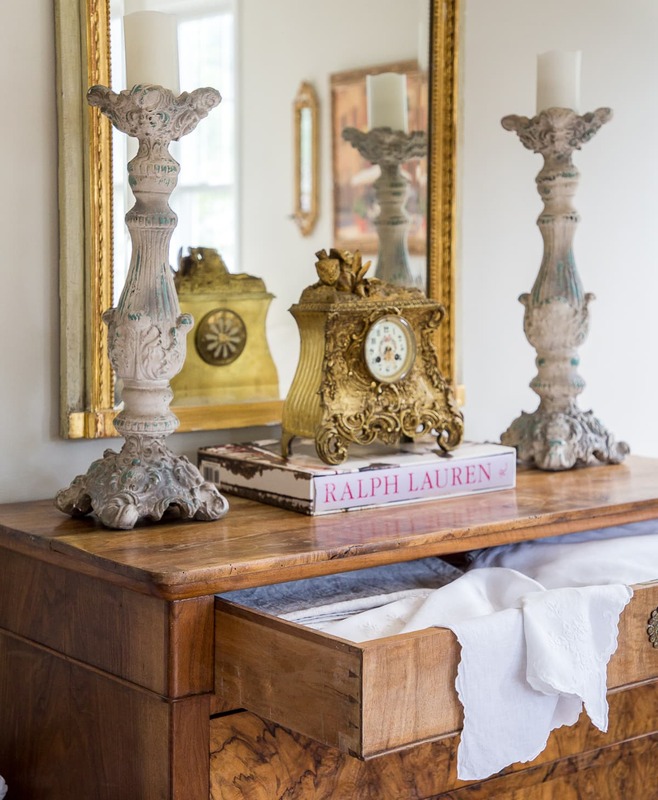 Store table linens in a bureau – Many years ago I bought a beautiful antique burled wood chest. The wood is stunning but the piece is in terrible shape and the drawers are not so easy to open. They work best when the contents are as light as possible, so I like to use them for my table linens. Like plates, I collect a lot of these and the many drawers provide ample storage. I keep tablecloths, napkins, runners and throws in these drawers and as a result, I can store all my linens in one place. 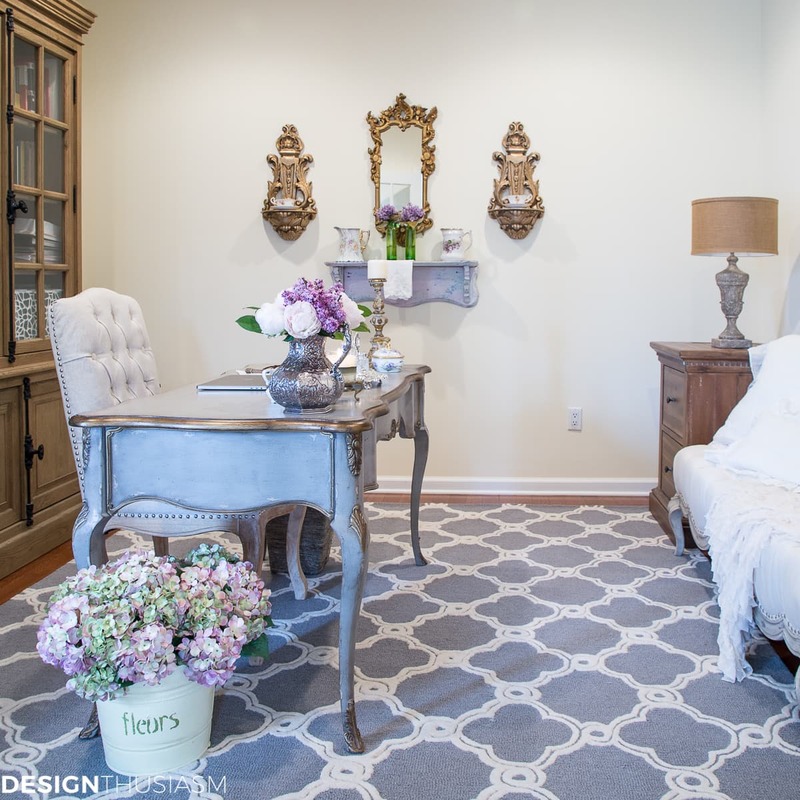 When you’re pressed for storage space, utilizing furniture for this purpose is a key strategy. 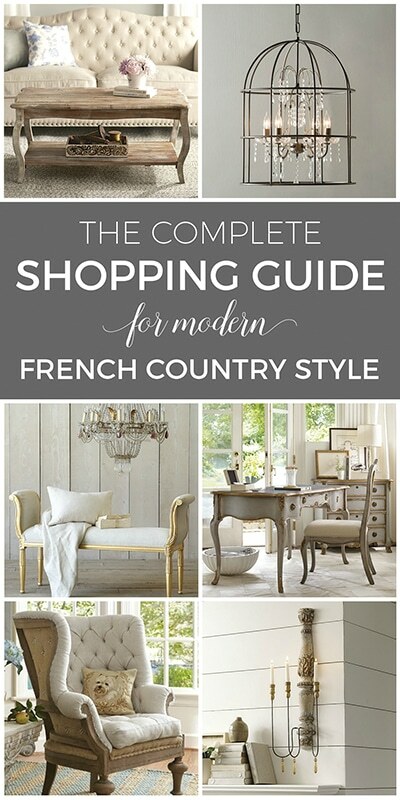 As I shop for furniture for almost any room, I always opt for the piece with drawers or shelving. 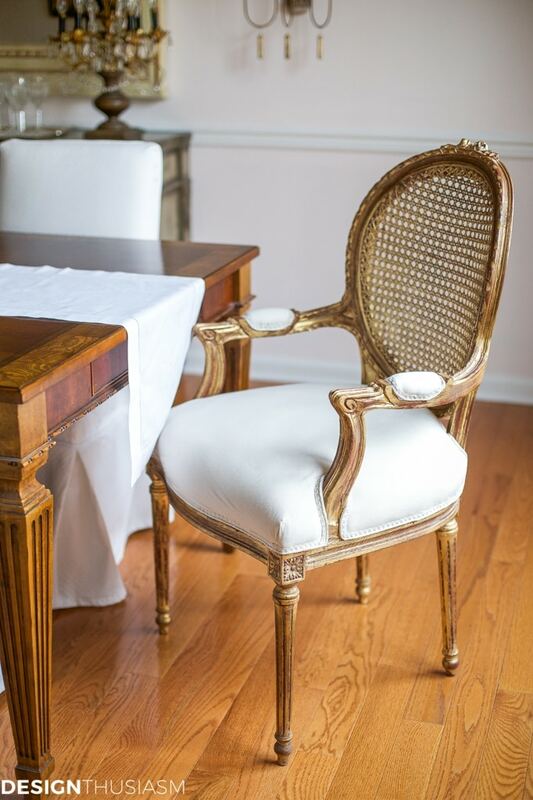 I needed a piece for this spot in my living room anyway, so why not pick a piece that could hold all of my table linens? 4. 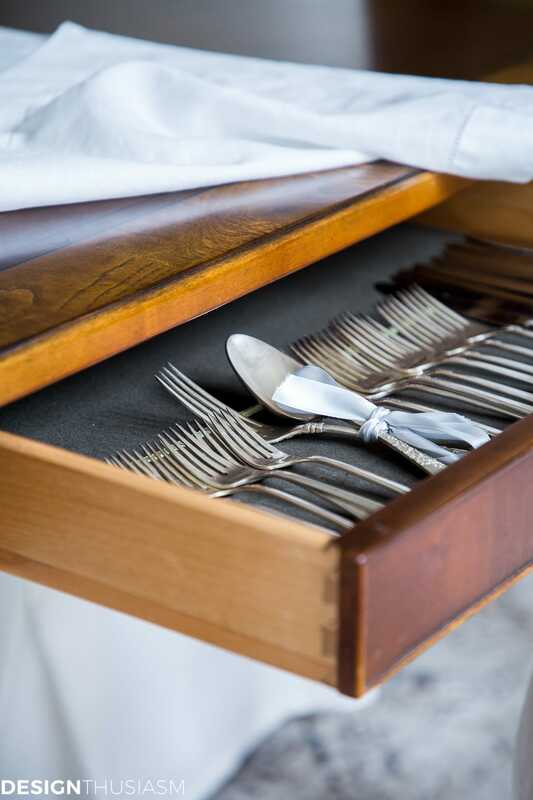 Store flatware in a dining table drawer – This is one of my favorite little secrets. Our dining table has tiny drawers at either end. For many years I didn’t use them as they were very shallow and frankly, I forgot they were even there. I always kept my silver in a traditional storage box that’s packed away in a cabinet. But as I began to entertain more and more frequently, doing lots of table settings, I wanted my flatware to be more accessible. I also wound up with an extra set when we were cleaning out my parents’ house and so I keep one set at one end and the other set at the other. It’s not the entire set by any means, but I keep my most often used pieces there and it’s an enormous convenience. 5. 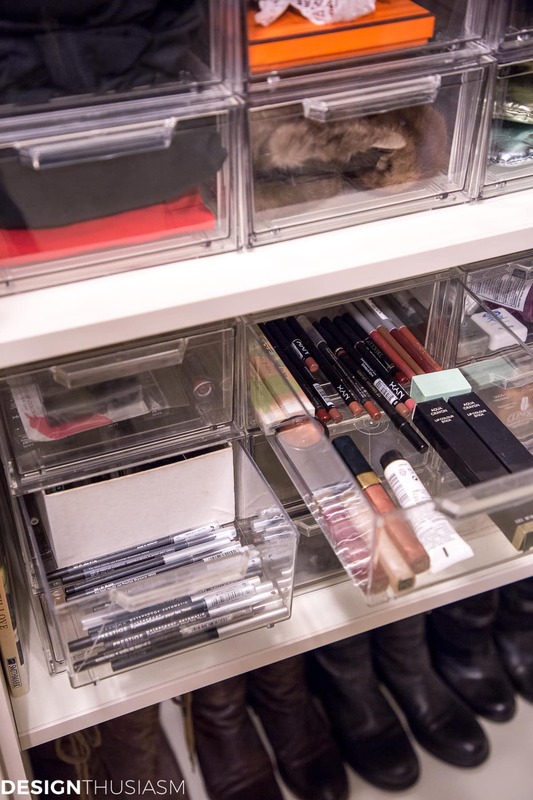 Store cosmetics and makeup in shoe drawers – If you’ve been reading this blog for any length of time, you already know about my obsession with shoe drawers. I keep everything in them! I designed my closet shelving around the exact dimensions of the shoe drawers and they’re one of my best defenses against being overwhelmed by clutter. And since I’m also fixated on efficiency, I tend to buy favorite products in multiples. So while I keep my current makeup in my dressing table, I store the extras in shoe drawers on a shelf in the closet. 6. Store earrings in clear bead boxes – Another of my favorite storage solutions, I love to keep earrings and other decorative jewelry in individual compartments in clear bead boxes. I store them by color so I can always find what I’m looking for and the separate sections ensure that the earring pairs stay together. 7. 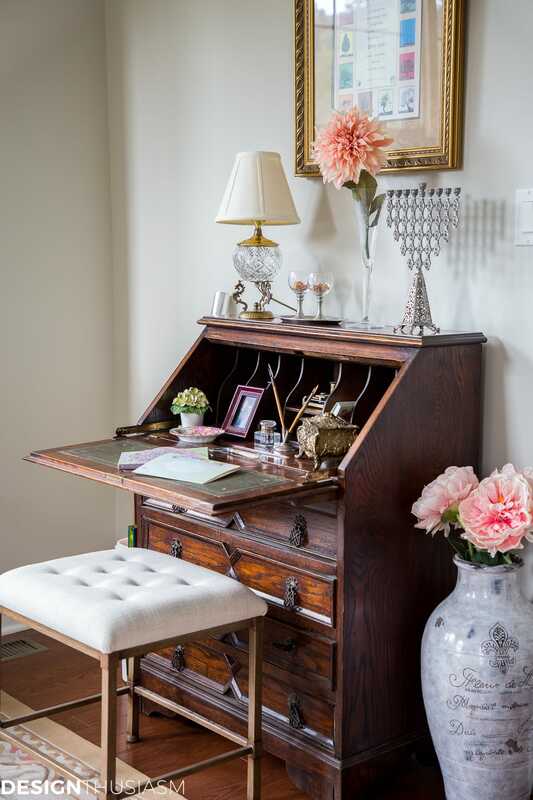 Store gift wrap and cards in a writing desk – Perhaps this one is not surprising if you actually use a writing desk, but how many of us really do that? I like to have “stations” in a room that serve a particular purpose, so the writing desk in our living room is dedicated to wrapping and cards. The drawers are perfect for stationary, gift tags, tissue paper and greeting cards, while a pail at the side of the desk is where I keep wrapping paper rolls. Of course it’s on the far side of the desk where it’s not so obvious, because it’s not the prettiest thing to look at when you enter a room. 8. Store paper files in a book case – The obvious place to keep files is in a classic file cabinet and we do have two in our home office. But as you get older and life gets more complicated, there always seems to be a need for more and more files. I use pretty lattice file boxes for current projects or anything that doesn’t fit in our file cabinets, and store them behind the desk in our large bookcase. I’ve only touched upon some surprising places that I like to stores things, but in the upcoming months I will get more and more into storage solutions, as it’s a clear pressing need for so many of us. As many think about downsizing with life’s transitions, it’s important to realize that not everything you keep needs to be stored in your house. 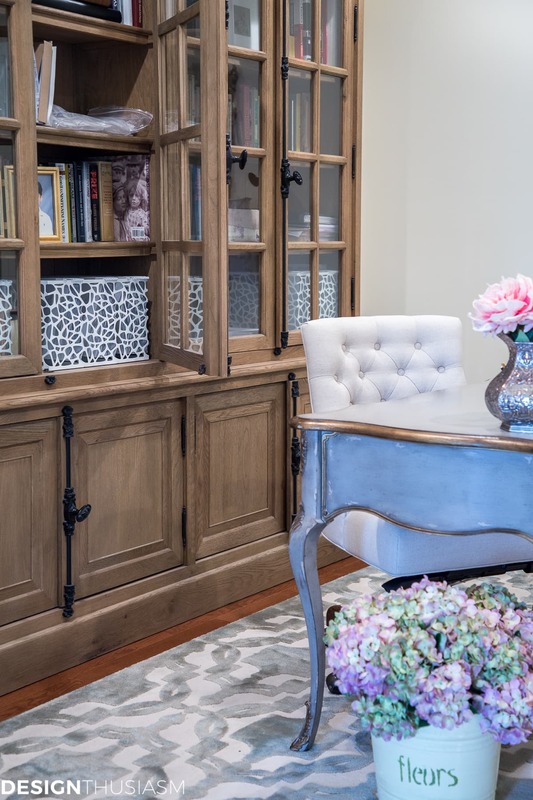 While Extra Space Storage can offer options for additional storage, they also have a wonderful blog that addresses these varied storage needs. 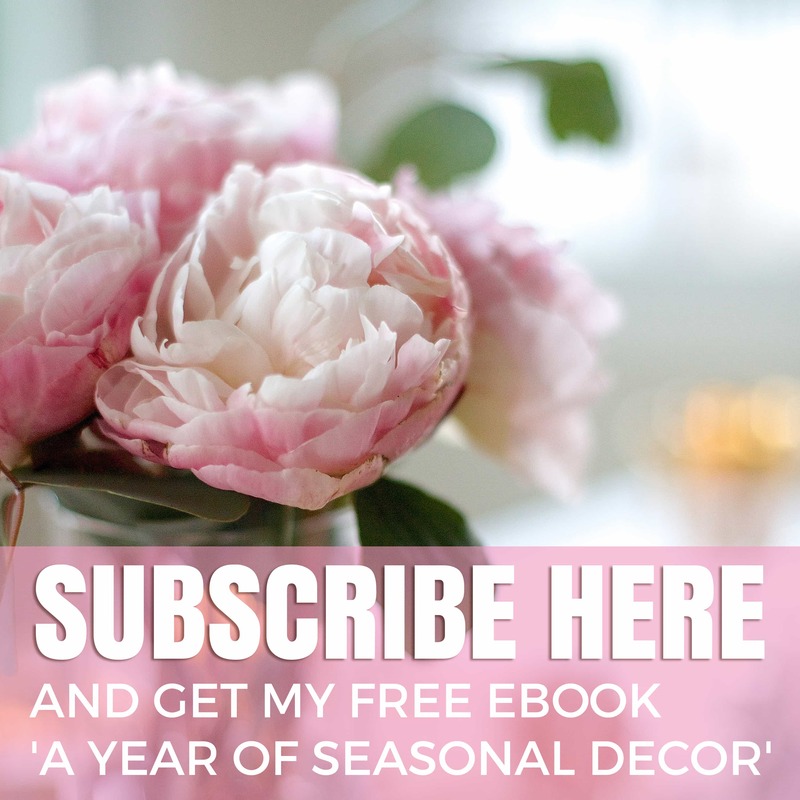 For more ideas about storage and home organization I encourage you to visit Extra Space Storage Blog. Every time I think I’ve solved the storage dilemmas in my home, new acquisitions crop up that require more solutions. From kids that are only half moved out to cleaning out parents’ houses, that empty nest doesn’t seem so empty anymore. Like many of you, I’m at this exact crossroads in life, so how about we navigate these very cluttered waters together? Storage Solutions Source List – To get the look, click on the items below for direct links to the products. Where actual items were no longer available, I’ve provided similar options. Good morning Lory…although I follow you this is the first I’ve learned of your obsession with clear shoe storage boxes for all things…wonderful idea…any chance you could post a photo of your closet? (But I also use them in my linen closet and pretty much everywhere else, too… ;-)). Love your storage ideas – teacups, earrings, cosmetic storage, lattice filing bins…but then, I love everything you post! Thank you for the kind words, Sharon! You’re so sweet!! Loved all the good storage information. I’ve always kept my shoes in their boxes but the clear boxes would probably help me wear more of them more often. Since I have him most days, I use the clear shoe boxes for my grandsons clothes. Onesy’s fit perfectly, so far. Thank you for this great post. You’re most welcome! I’m glad it resonated with you!! Such great ideas! Thanks for inspiring me to rethink some storage options! You could make covers for all your books with paper that matches your decor and the title printed down the spine (like a dust jacket so it just folds around the cover without being permanently adhered) then you don’t need to have your books facing the wrong way. When we were in a tiny house in the days before AC was everywhere, I stored extra blankets between the mattresses, especially in the summer. I learned then, and even occasionally today, the value of under the bed storage as well. And as a serious cook and baker, every cabinet door in my kitchen has ‘command hooks’ holding something! Thanks Lory for sharing all your storage ideas. I was finding I just had too much stuff. For me the best incentive to declutter was moving! (I am in my seventh home and this is it!) 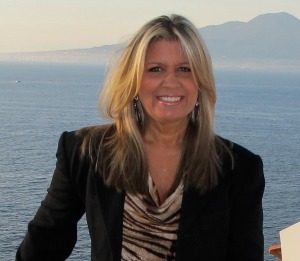 I discovered to truly succeed in this task I had to have a positive mindset. I realized my extra goods can truly enhance another’s life when I donated to our local women’s shelter, Ronald McDonald house, cancer society. 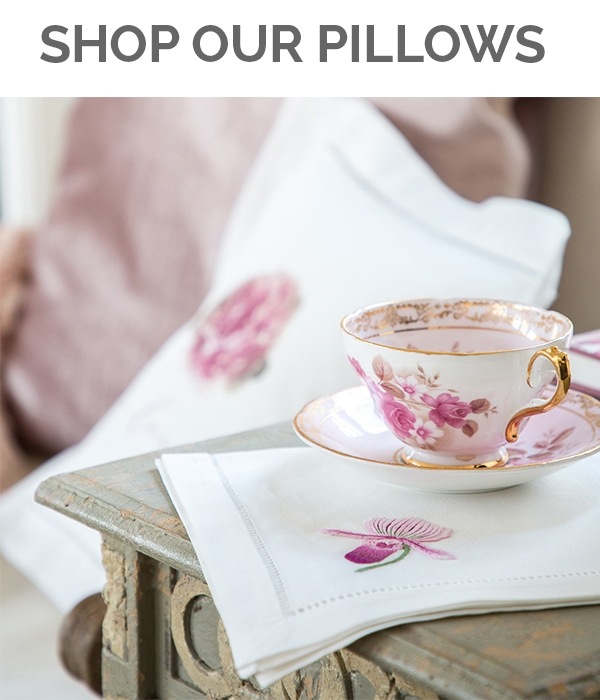 (Everyone likes tea from a pretty teapot or to snuggle under a pretty duvet.) I also had a yard sale and used that extra cash for a family night out. I tackled a few items at a time ( I put all my vases on the dining room table sorted by colour giving me a good visual. I asked myself- Do I need this many glass vases? Do I really need four of a similar size?) Remember you don’t have to do it all in one day/week. Give yourself doable time limits. Celebrate each completed task with a cuppa or a glass of wine! Love all your ideas. Because I have such little storage space I have learned to put white tissue paper on the top and bottom of my placemats, and put them under the cushions of my couch and chairs in my “un-used” living room. It keeps them flat and in perfect shape for use. Thank you! And that certainly is a creative solution!! Thank you Lory for the tips and encouragment! I know I certainly need it! I’m at the point where I need to consider calling in a professional at this point. It’s gotten THAT BAD!! I moved all my stuff into my partners house and there is zero storage and being a neat freak, it’s really getting to me. I’m begging him to move at this point because we simply need more room! LOL! I need your words of encouragment so keep them coming! Thanks and have a great weekend! I’m on it! It’s a constant battle, so I know how you feel… 🙂 Will share as I go! 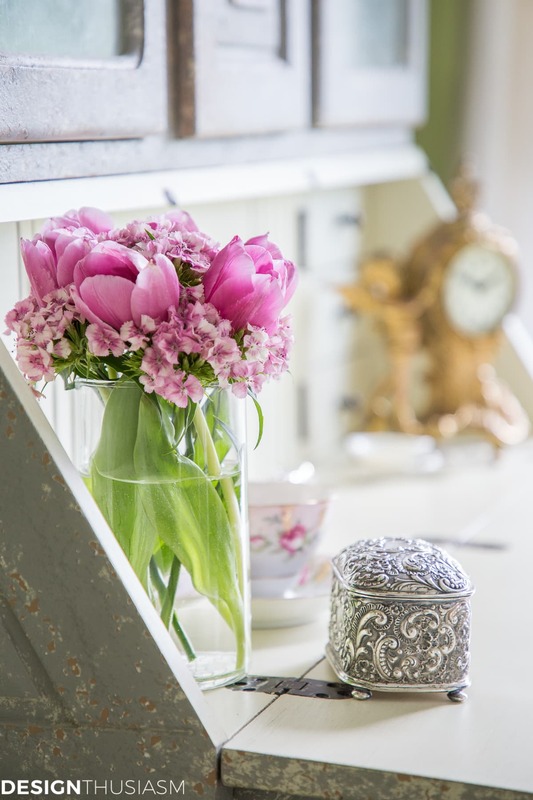 Love the flatware storage in the drawers of the table! Did you buy special lining for each drawer to prevent tarnishing? Thanks, Lynn! The drawers actually came lined, so I guess they kind of are made for that. Still most people use the wooden storage boxes instead which is where I keep the rest of my sets, but I use my silver so often, that it’s much easier to keep them in these drawers… 🙂 They also tarnish less when you use them often. Two suggestions to declutter: donate unread or no longer needed books to your local library. They often resell them in book sales to raise money. Then use a scanner to eliminate having paper files…and store these things digitally.